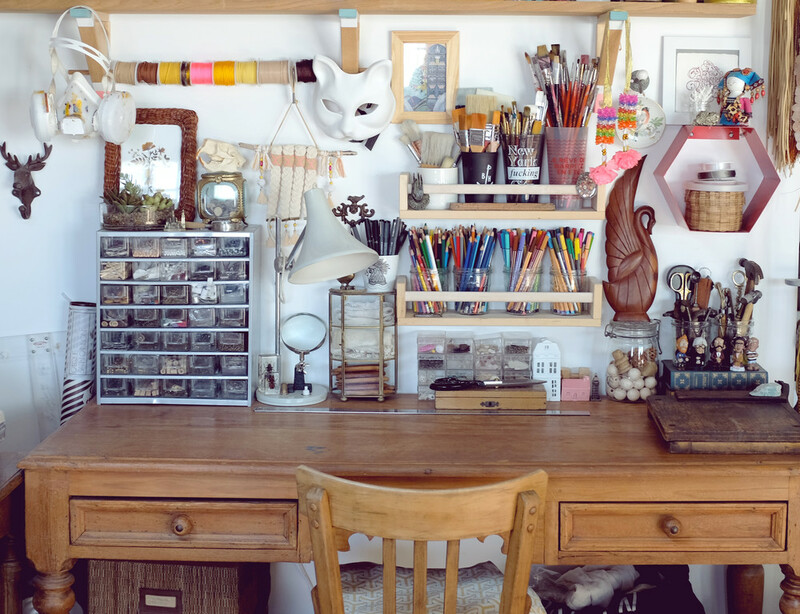 When we work at home a well-defined workspace is a necessity, because putting all the things away every day is out of the question. This workspace must also be functional, but the wellness notion mustn’t be neglected because it is a space where we spend many hours everyday. When I talk about wellness, I refer to the pleasant sensation you feel when you sit at the desk, the sensation that it is the perfect place to create and work. 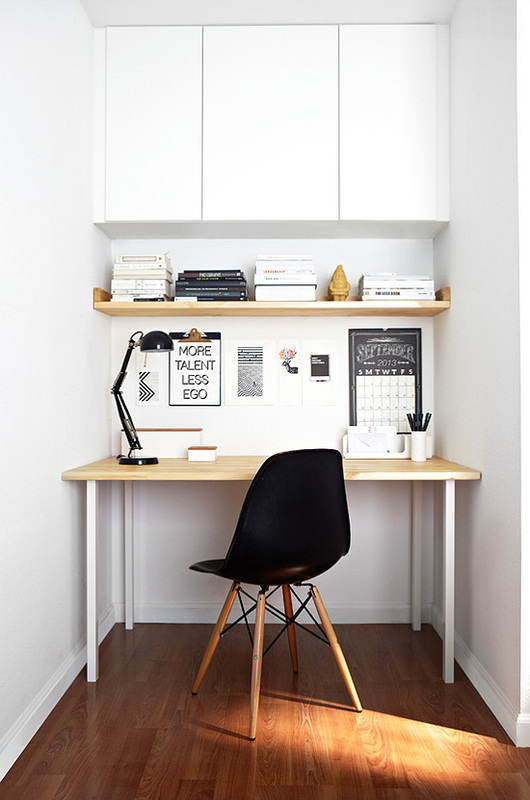 Obviously, when I started to think about my desk I started to visit Pinterest. I wanted a desk with a sleek design, easy to clear, without distractions. 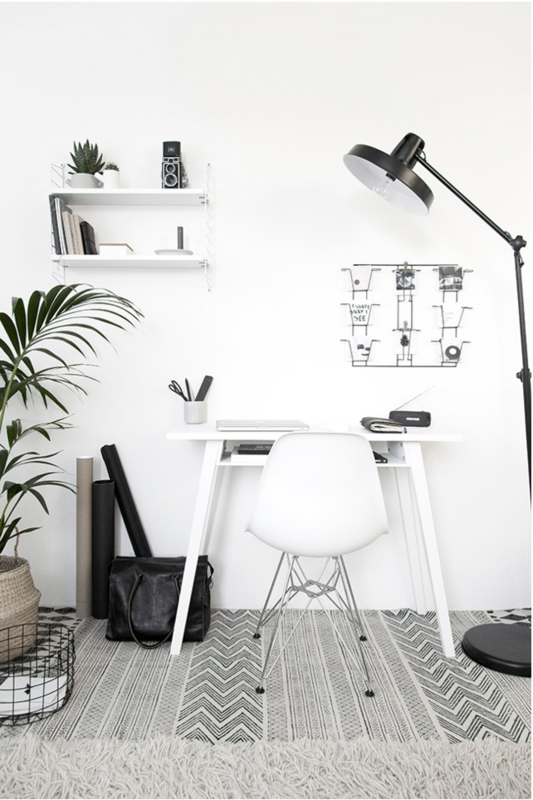 I started to collect pictures of white workspaces, with a scandinavian style. Everything would be in its place leaving on the desk only the essentials. Logically, the colors should be neutral : white with a touch of grey and black. Clearly, it was only an ideal vision, because an artistic job means having a lot and a lot of material and therefore, needing a lot of functional storage within reach, like these large drawers. 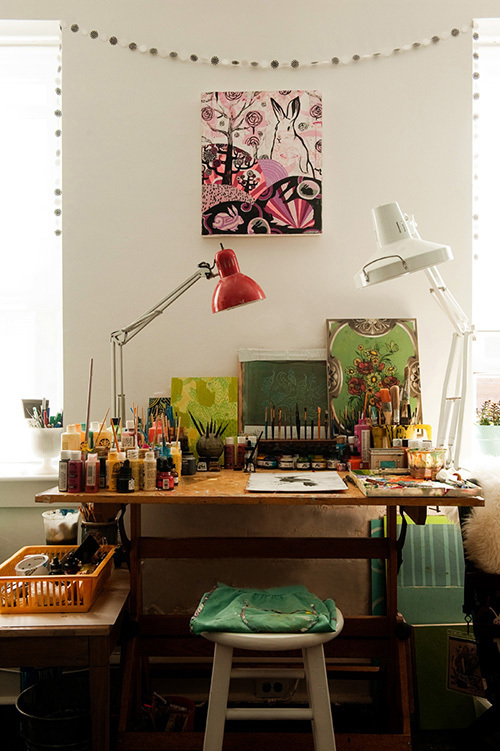 When I was looking for some ideas on Pinterest, I found far more exciting pictures of workspaces. The mind was telling me to be pragmatic, to not get distracted and the heart was telling me to create a personalized space, in my image, a space stimulating my creativity. My first objection to pragmatism was : having a lot of storage is a good thing, but all the stuff must be easily accessible, because open and close drawers all the time become quickly unnerving. 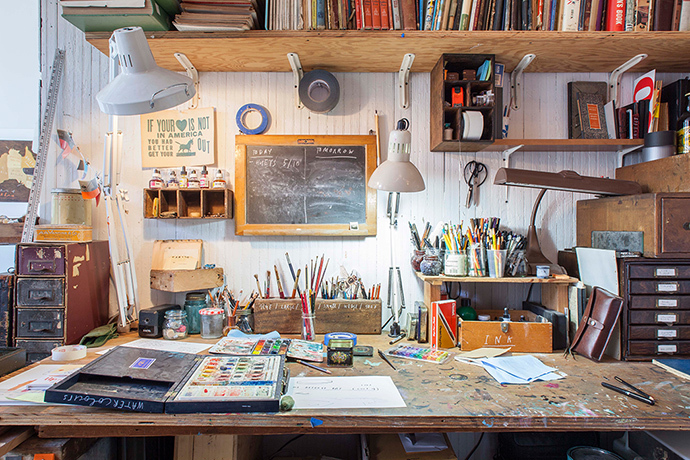 I realized that the pictures with many supplies on the desk enjoyed me more than white organized spaces. The second objection was related to my way of working. I know very well that wanting a bright space may not be adequate to me. I need inspiration from things I like, from others artists illustrations, from books or from my own creations. 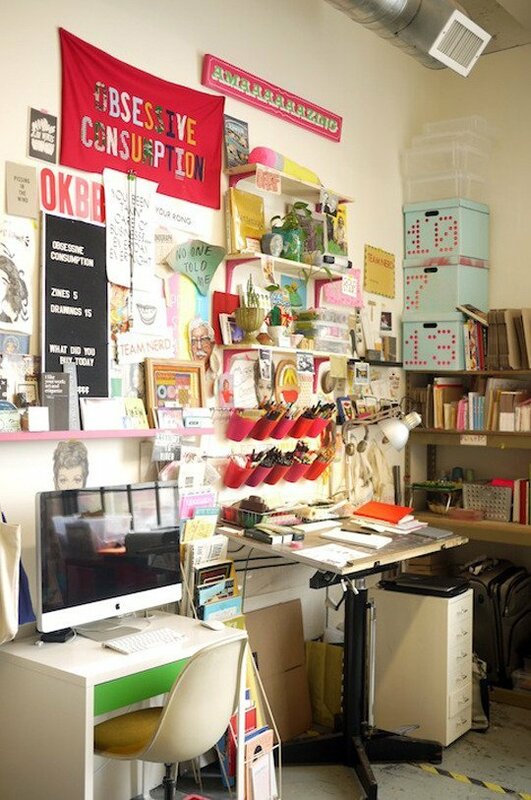 I can easily imagine a moodboard above my desk. So, emotion or pragmatism? Do we have to oppose both? 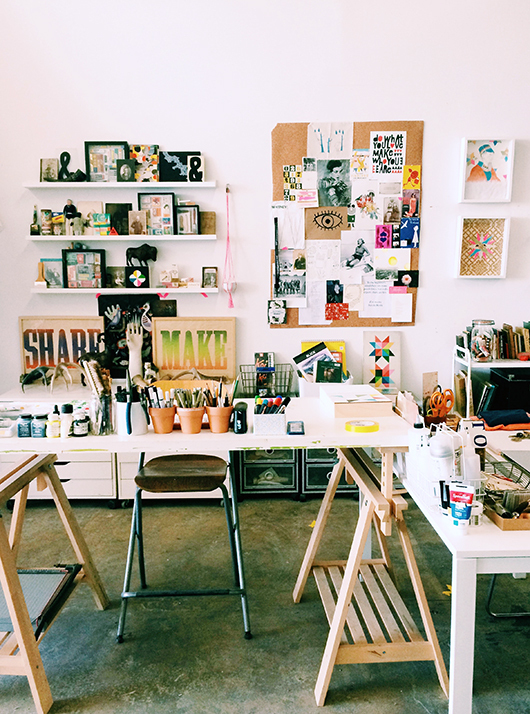 A bright workspace is necessary to think clearly? I’ll show you on the next post how I chose to organise my desk. And you? Did you follow the heart or the mind?